Model trimmer is widely used is restorative dentistry. It is a necessary tool(dental lab equipment) fou trimming plaster model. 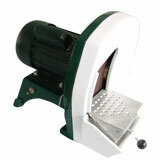 This machine is made of rush-proof all-cast aluminum. The angle can be adjusted to more than 30degrees, which enables the users to achieve perfect trimming quality. Company: Tianjin Lizhong Electronic Co., Ltd.